Remember when music was fun but clever? When you didn't have to dumb it down to dance to it? Much like neo-new wave giants The Killers, Franz Ferdinand and The Faint, Jonezetta is here to rejuvenate a pop landscape that has forgotten you can have fun and brains, too. And all without taking yourself too seriously. When Jonezetta frontman Robert Chisolm shouts out, "Wake Up!" during "Burn It Down," it's an exhortation as much to the musical masses as the audience in front of him. Isolation breeds artistry, and like The Smiths or The Cure, the Jonezetta story begins with creative people bursting through the seams of an otherwise stuffy environment. Clinton, Mississippi is a very tiny town. If you're a young boy, you either play sports, go hunting, or both. "We come from small families within a sheltered town and our parents made it obvious that we were to go to school for twelve years and then to go for four more years," Chisolm deadpans. "The idea of not going to college and trying to pursue music was never a reasonable one in our heads." Jonezetta began as a lark. Even their name was birthed off the cuff. It was designed to combine two words that don't go together but sound cool (like Radiohead, Coldplay, or Starsailor) but as Chisolm admits, "all of the good words were taken." It wasn't until they took a long hard listen at the demos they were creating purely for their own amusement that Jonezetta realized how incredibly special their band could be. "When we met [co-manager] Ryan Rado and the guys in the band As Cities Burn, they really gave us hope that pursuing music simply because its something we love is not a bad thing," says Chisolm, who credits the pair with bringing Jonezetta to Tooth & Nail's attention. Cue a bidding war that involved several major labels and one of the biggest deals for a new artist in The Nail's history. 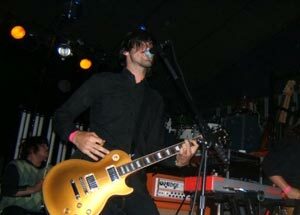 Jonezetta has quickly amassed a slew of believers in the music industry and across the rock and pop underground. And the mainstream is next. Like the rich blues embedded in the soil around them, Jonezetta's Tooth & Nail debut is full of mood and atmosphere, with hooks that slice through the fog the way song titles like "Hot Machete" would suggest. And from here, with a coveted slot on the 2006 Tooth & Nail tour ahead of them, Jonezetta's goals remain as modest as ever. "We want to be the first band to sell a billion records," laughs Chisolm. "We want to play every continent in the world. And then, we want to meet Prince." "People take themselves too seriously. Music today has become such a downer," he adds thoughtfully. "We encourage kids to enjoy themselves."